I am back from the Greer-Heard Conference, which was held at New Orleans Baptist Theological Seminary in New Orleans, Louisiana, this past weekend (February 25-26, 2011). There was much discussion in the forums and presentations, but the object of attention was the debate on the historical Jesus, between Dr. Craig Evans of Acadia Divinity College and Dr. Bart D. Ehrman, James A. Gray Distinguished Professor of Religious Studies and the Chair of the Religious Studies Program at the University of North Carolina at Chapel Hill. 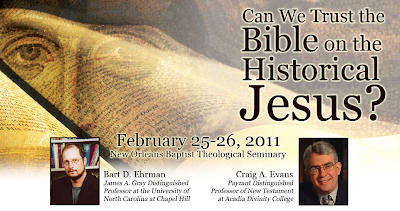 The debate was held on Friday night, February 25, 2011, at 7:00pm in Leavell Chapel (on the New Orleans Seminary campus). Dr. Ehrman was allowed to speak first. His opening statements on the Scriptures themselves were magnificent. While listening to him, I was reminded of how captivating of a professor he really was, reminiscing over my own New Testament Literature class with him at the University of North Carolina back in Spring 2003. Line by line, Dr. Ehrman pointed out what he believed to be “historical discrepancies” in each of the four Gospels. For instance, he noted how one Gospel has Jesus dying on the cross during the week of Passover...while another has Jesus dying after Passover. “Which is it?” he asked. “They both cannot be right.” By the end of his opening statements, I got the distinct impression that defeating him would be a tall order. And indeed, a tall order it was. In fact, it was such a tall order that I don’t even think Craig Evans came close to meeting it. Evans’s opening statement did not even respond to Ehrman’s claims. Instead, Evans simply tried to make a connection between the Bible and other works of antiquity: how the works of antiquity were written hundreds of years after the individuals lived and yet, they were still accepted as historical sources. When compared to these ancient works, the Gospels (according to Evans) had a rather outstanding record: the Gospels themselves were written no later than 35-40 years after the death of Christ. His argument was a lesser-to-greater: if the ancient sources were historically credible, having been written some hundreds of years after the events they record, then how much more historically reliable are the Gospels? But what this really does is attempt to create “damage control.” Damage control is a tactic used to make something seem better than it may be portrayed as being. In fact, Evans’s remarks were pointed at the sole purpose of making the Gospels seem “less historically questionable” than the other sources of antiquity. Still, at the end of the day, making something “less questionable” or “the lesser of two evils” does not eliminate it from being still “questionable” or “evil.” Deeming something “less heretical” does not make it “orthodox,” so deeming the Gospels “less historically questionable” does not make them “historically accurate.” Evans’s damage control did not control...rather, it damaged the Gospels’ reliability even further. Ehrman made it clear quite a few times in the debate that “I want you all to know that Dr. Evans is agreeing with me.” At one point in the debate he said, “I expected to have a debate where the opponent actually disagreed with me,” laughing to express how unbelievable the debate really was. These remarks are telling, indeed: the fact that Dr. Bart Ehrman was given “academic high-fives” from Dr. Evans shows just how horrible of a debate it really was. What has gone wrong in our world when the evangelical scholar begins to agree with the agnostic scholar about Jesus? In the concluding remarks in the debate on Friday night, both got a chance to reiterate their points. Ehrman made it clear that the Baptist Faith and Message 2000 stated that the Bible contains “no mixture of error.” And yet, according to Ehrman’s evidence, the Bible contained historical inaccuracies that Dr. Evans could not explain away (nor did he try). Premise #1: Proverbs is about Lady Wisdom speaking truth. However, there is no specific person speaking here (just personification). Premise #2: In the Gospel of John, Jesus (as “Logos”, the Word) is representing Lady Wisdom speaking truth. Conclusion: If Jesus is representing Lady Wisdom, then He, like Lady Wisdom, did not literally say the things recorded about Him. The emphasis is not that He literally spoke truth, but the true words He spoke. Dr. Evans did not actually say the conclusion in his ending remarks; he simply left it to the evangelical mind to “fill in the blanks” of his argument. What he was trying to get at was that John’s Gospel is all about “the Johannine community’s affirmations about Jesus,” not that Jesus actually said and did the things that are written of Him. This has problems, however, when one comes to the biblical text.